Webster’s Dictionary defines “discredit” as, “harm the good reputation of (someone or something).” The political season is upon us with all its power and fury. We hear one candidate after another trying to discredit his/her opponents. Some of the meanest things are said with little or no regard for the other person’s well-being. People seem to thrive on making the other person look bad. That is not unique to the 21st century. Jesus had so many encounters with those who would discredit him. In our text today, the Pharisees did their best to discredit Jesus. Jesus recognizes their intent to undermine and discredit him. 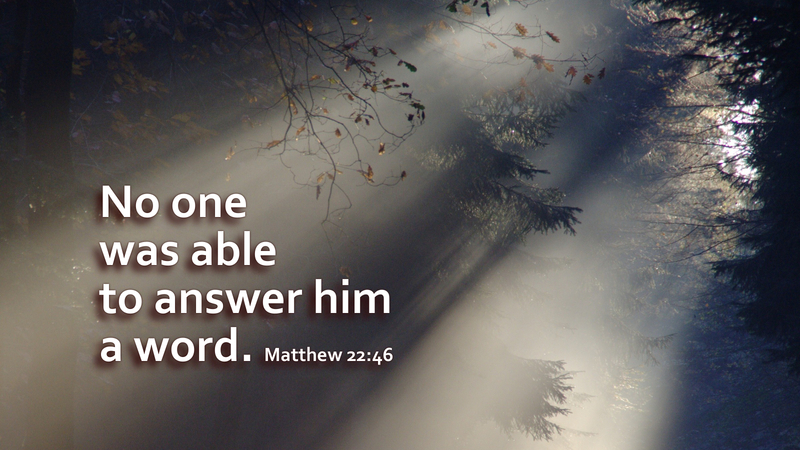 “‘If then David calls him Lord, how is he his son?’ And no one was able to answer him a word, nor from that day did anyone dare to ask him any more questions” (Matt 22:45-46). Jesus took their malicious intent and refused to play their games. We may sometimes think that our culture has rejected Jesus. Do you know of any other leader of world religions that has been more maligned than Jesus? But no amount of discrediting or disrespect will change anything about Jesus as Savior, Risen Lord, and Almighty God! Prayer: Lord Jesus, increase our deep love and respect for you. Amen. Today’s devotion was written by Thomas Corbell, Pastor of Mt. Hermon Lutheran Church in Statesville, NC.